Today I relaxed and rested after the beginning of my weekend was so busy. I re-positioned one of the tweeters in the car so that they’re both angled the same (or at least really close) - they’re hot-glued onto the bracket they sit on, and it took me three tries to get the angle good enough. 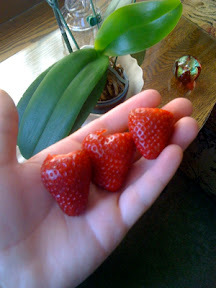 After that I sat around eating the really tasty strawberries my mom got this morning from the farmer’s market; and tonight we played the Cities and Knights expansion of Setters of Catan, and I won accidentally. I say this because I had achieved victory without knowing it, and when Teenie reached a certain progression in the game she inadvertently caused me to realize I had more than the necessary points needed to win. 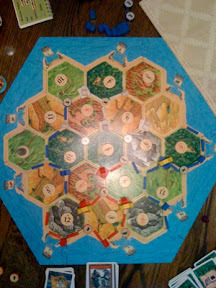 Here’s how the board looked at the end of the game; Please note; while I have my twitter pictures running through the mini-feed at the top of my blog, I think that re-posting them in actual blogs will result in them being seen after the twitter feed no longer displays the links (and I’ll be able to keep track of them better). Goodnight!